Are these really the best views in all of Durango? Magnificent views, remote location, only 5 miles from town! Magnificent views, remote location, only 5 miles from town! 2 bedrooms,(king/king), 1 bath guest house on large estate bordering Perin's Peak. A hiker's dream - the surrounding Perin's Peak National Forest offers numerous hiking with absolutely stunning 360° views. A full kitchen that has been recently updated with all new granite countertops, vaulted living room, gas BBQ, high speed internet, satellite TV, BluRay DVD with Netflix and parking are included. The bathroom was also recently updated with a beautiful new ceramic/porcelain tile tub/shower combo. Absolutely No Smoking Allowed. Shopping, and restaurants in downtown Durango are only 5 miles away. Looking for hike? The trailhead for the 500 mile Colorado Trail is just 1.5 miles away! Sorry, but no pets allowed. A 4 wheel drive is required in the winter. This gorgeous home is available as a monthly rental. Please contact us for special pricing! This is the second time we have stayed at this property and loved it just as much as the first time. The views are amazing. The apartment is perfect for us and our two children. Bill and Bonnie are wonderful hosts. They set up the house so that it would accommodate our rambunctious 1 year old (they put up a baby gate when they knew we were coming, had a pack n play ready, and the one room was full of toys and books). The amenities are in great condition. Our girls loved the horses. It is close to town and on the way out to the national park. All in all, another great stay and we will be back again soon! Thank you for taking the time to write a review. Bonnie and Bill are wonderful and they will always make your stay special. No matter how many times you come back, you'll continue to be impressed. It is a beautiful property. Hope to see you again soon. Mountain Memories is on the second floor of a working barn, which is part of its charm. Everything on this farm shines with care. After traversing up the private gravel road (don't worry, we made it in our little rental), we were met by the owner Bill who showed us around, explained how everything worked, introduced us to the horses and dogs and even helped carry one of our bags upstairs. We stayed 3 nights and would do it again. Everything worked and was well stocked and beds were very comfortable. We explored Mesa Verde National Park (about 45 minutes away), Durango and hiked part of the Colorado Trail which is only minutes away. Bill was a perfect host, helpful, but unobtrusive and it is a unique property. Stay there if you get the chance! Thank you for your feedback! This is a very unique property that time after time receives 5 star reviews. It's location, views, and the hospitality from the homeowner Bill are unparalleled. Hope to see you again soon. The Mount Memories property turned out to be our favorite of many VRBO stays. The property itself is amazing and the hosts were exceptional. If you like being a few minutes from town, but able to walk out your door into a wilderness preserve, this is for you. It is a FIVE +. This home is the "best of everything". Thank you for your review. 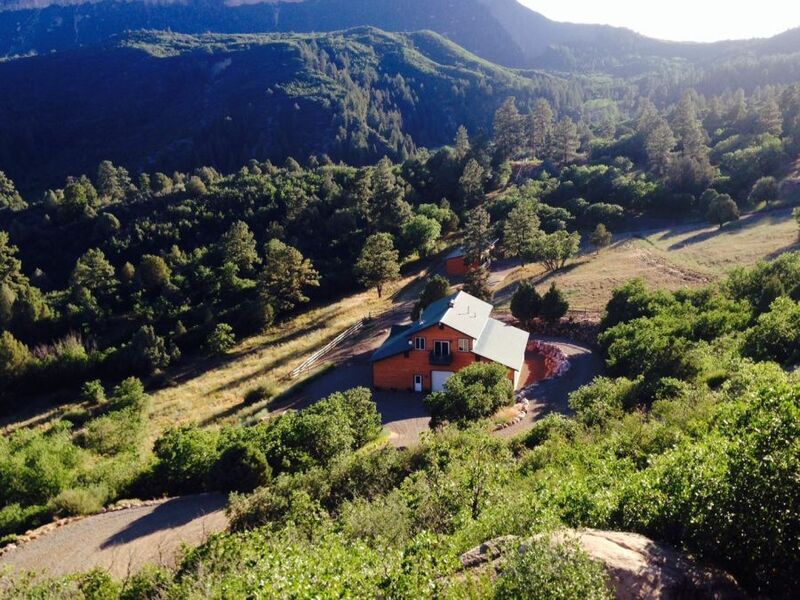 Minutes to downtown Durango, yet a very private and serene setting. The home has everything you'll need for the perfect vacation. Thanks again. Our week in Durango was lovely! The guest house has incredible mountaintop views; it’s like new, granite countertops, fabulous bed, and equipped with everything you’ll need. Thank you for your feedback. This house get's nothing other than 5 star reviews and now that you've had the chance to experience it for yourself, you too gave this home 5 starts. We couldn't agree more. Beautiful home, Privacy, well appointed, great hosts, unique location and an AMAZING setting are just the beginnings of a a great Durango vacation. 1st - great king size beds. Very comfortable, slept great. 2nd - very well equipped home and very well maintained. 3rd - enjoyed feeding the horses and seeing the dogs, even when they barked at me. 4th - owners right on site and super nice. Thank you for taking the time to review this fantastic property and the super nice owner. Bill is a hands on guy that works very hard to give his guests a 5 star experience every time!! Glad you enjoyed your stay, and we hope to have you back again soon.